Officers arrested nine suspects at two adjacent drug houses in Atascadero on Wednesday after the county sheriff’s SWAT team conducted a search of the location, according to the Atascadero Police Department. Investigators recently obtained information that narcotics sales may have been taking place at the homes and that stolen firearms could be there as well. Police requested that the SWAT team serve the warrant because of the possibility of stolen firearms being at the homes and the violent criminal histories of the suspects. As officers were serving the search warrant, several residents initially refused to leave the homes. Eventually, officers contacted and detained a total of 14 people on the property. Investigators seized suspected stolen property and are in the process of determining the rightful owners. 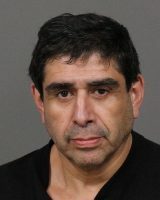 Officers arrested the owner of the property, Anthony Robert Riva Jr., 53, for operating a drug house and being under the influence of a controlled substance. An additional eight suspects were also arrested. Grace Ann LeBlanc, 51, was also charged with operating a drug house, as well as possession of drug paraphernalia. Sean Michael Loppnow, 34, was arrested for possession of methamphetamine for sale and possession of heroin for sale. The other six suspects — three of whom are Atascadero residents and three of whom are Paso Robles residents — were arrested for offenses including resisting an officer, violating probation, having outstanding warrants, felony impersonation and manufacturing a controlled substances. Those six suspects are: Alan Howard Algie, 56; Trissa Bebe Blackburn, 23; Melissa Dawn Currie, 34; Samantha Hope Maxwell, 21; Travis Dee Reeder, 24; and Troy Lee McGee Jr., 30.